Last year for BlogHer I stayed at the gorgeous Omni Birkshire Hotel in NYC. We’re going back for BlogHer in Chicago this July and I’d love to stay at another Omni Hotel in another city. Their hotels are simply stunning and the service you receive is top notch! I have enjoyed every night I have spent in an Omni Hotel. 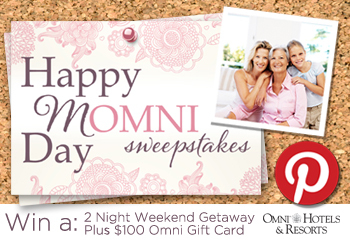 Omni Hotels & Resorts is proud to announce this year’s tribute to Moms everywhere, the “Happy Momni Day” Sweepstakes!! They are encouraging people to use Pinterest to celebrate the beauty and joy of motherhood by pinning images of things that Mom loves, and the Omni experience you or she hopes to win! • Go to OmniHotels.com and pin a few images of your favorite Omni Hotel(s) to your sweepstakes board… Which Omni would she love to visit? Does she love the Spas? To pin from OmniHotels.com you will need the Pinterest browser Pinmarklet. Tag each pin with #omnihotels and #sweepstakes. • Pin a few mom-inspired pins about your mom, or yourself! Some suggestions: What makes your mom special, food or drink recipes she loves, her style, her sense of humor. Again, tag each pin with #omnihotels and #sweepstakes. So what are you waiting for? Enter for yourself or enter for mom and surprise her! Connect with Omni Hotels on Facebook and Twitter!